We’re not dead here at AKClimber, just busy with holidays, family, training, working on the guidebook, a new business venture, and planning a trip. It’s a bright new year filled with endless possibility! Most people I know start the year filled with big dreams and ambitions, not nearly as many look back on the year with the pride of fulfilling those dreams. To get the year off right, here are some things that I have found to be helpful when evaluating the reality of my daydreams…. You have to have a strong personal interest in something to ultimately successful. You may reach the goal, but it won’t have the same satisfaction as it would if it were a true personal goal. Sometimes you fall short of your dreams, but if you’re shooting for the stars and hit the moon you still did incredibly well, and the stars remain there for next year! Let your dreams run rampant, but when it comes to actually pursuing them, you have to break them down into real tangible steps. Knowing yourself and looking back at your history should give you a realistic starting point to understand what is achievable. Your dreams are not new, so think about the last year and what has kept you from reaching them? Can that barrier be removed? How? This last step is seemingly obvious, but so incredibly hard for dreamers like myself. Personally, I dream of possibilities all the time and it’s hard to ground myself in realistic expectations. Kelsey, David, and I have been busy working on the guidebook and the pieces are slowly coming together. We’ve got the layout and colors done and are working on getting the bulk of the info into the book itself. I’d say we’re about 50-55% of the way done at this point, with quite a few big tasks done. Right now we’re looking to have in the vicinity of 825 problems in 5 major areas, with directions to quite a few more areas. I’m still hoping for an on the shelf date of sometime in April, which is doable, but we have quite a bit of work to do to get there. If you have any questions, comments or concerns about te guidebook, please let me know. So the training continues unabated, and still seems to be paying dividends. Once the outdoor season ended, I shifted to a weight routine 4 days a week (2 upper body days and 2 lower body days) and repeaters for the fingers for about 8 weeks, then eased off the weights and shifted the fingers back into MAW hangs. I’m currently on my 5th total cycle of added weight hangs since I started in June, and each cycle has seen at least a 5% increase in strength. My climbing feels really good at the moment, and the next weakness I’d like to focus on is flexibility and range of motion. I’ve been getting into the gym climbing 1-2 times a week as well, generally one time on rope, and one bouldering, which has helped maintain the movement, and transference of strength to the wall. I just ordered a bulk order of Asana pads (cheaper to ship them via pallet) for both resale and as rentals. A few are already spoken for, but I will have 3 KJ Highballs, 3 Hero Highballs , and 2 Pro-Spotters available. I’ve heard really good things about these pads, and they recently upgraded their foam to a higher grade foam. If you’re interested in buying or renting one, e-mail me for pricing and details. I’ll post up pictures as soon as I can, but here’s a teaser from the shop floor at Asana. First of the Custom AK pads from Asana. 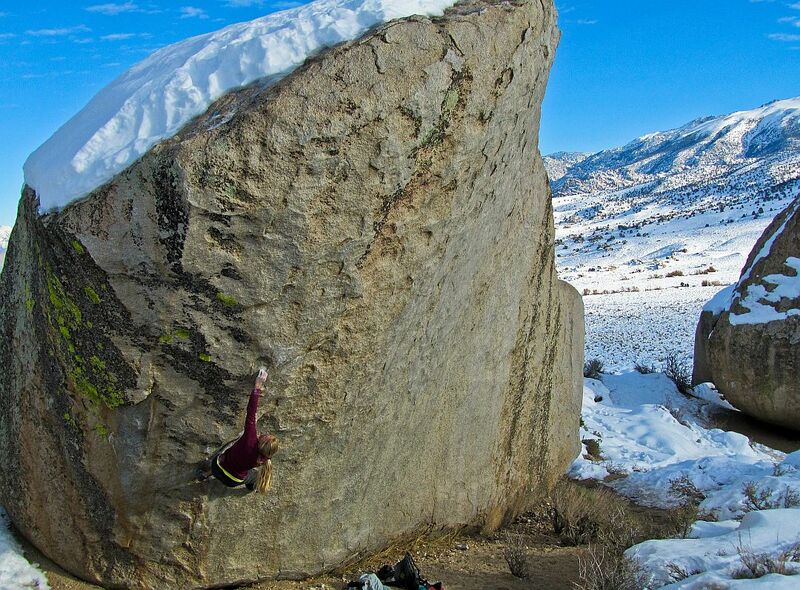 Lastly, I am heading to Bishop next week for a week with my old climbing partner Jeff and Chris B. It should be a blast and I’ll get a first hand opportunity to use the pads on some serious highballs! My main goal for the trip is The Mandala, an ultra-classic line first climbed by Chris Sharma back in 2000. Otherwise, I’m looking to have fun, meet new people, climb a bunch, then take a week off in Napa Valley with my wife and our good friend Anson.